RIS mode provides full support for PRMan's typical camera simulation, including the two standard projections that PRMan has always supported - perspective and orthographic - as well as features like motion blur and camera effects like Depth of Field and Bokeh. Additionally, RIS has added support for custom projection plugins, enabling the tracing of rays through arbitrary, potentially curved surfaces centered on the viewpoint. The distribution also includes built-in projections - sphere, torus, and cylinder - that are compatible with all modes of the raytrace hider. New in version 20, PxrCamera is a projection plugin that supports a perspective projection with a number of physical effects, including tilt-shift depth of field, chromatic aberration, lens distortion, vignetting, and a rolling shutter. A perspective projection is the kind we are normally used to, with a vanishing point at the horizon, and where objects shrink as they get farther away. Typically, we think of looking through the top of a pyramid, with the tip at the camera point, and the screen (film) plane exactly one unit in front of the camera. Objects are projected onto the screen plane along lines that intersect at the camera and get farther apart with distance. This projection allows users to specify depth of field settings for defocus, aperture settings for Bokeh, and shutter times for advanced motion blur effects. An orthographic projection is a much simpler projection. This is sometimes called a parallel projection, because here we project objects onto the screen plane along parallel lines that are perpendicular to the screen. They don't go through the camera at all, unless you like to think of the camera as being an infinite distance behind the screen plane. Objects appear the same size on the screen independent of their distance from the camera. 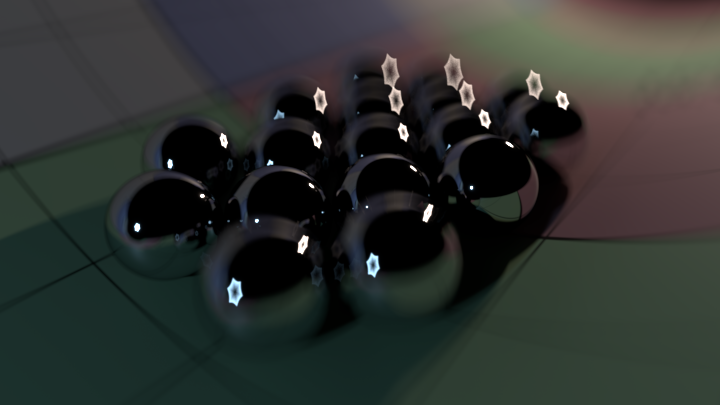 With the move to fully ray-raced rendering in RIS mode, however, new projections become possible. Sphere, cylinder, and torus projections can be used to render environment maps and panoramic images. User-created projections can also be defined using plugins; rolling shutters, lens abberations, and theater dome projections are just some of the possibilities this enables.